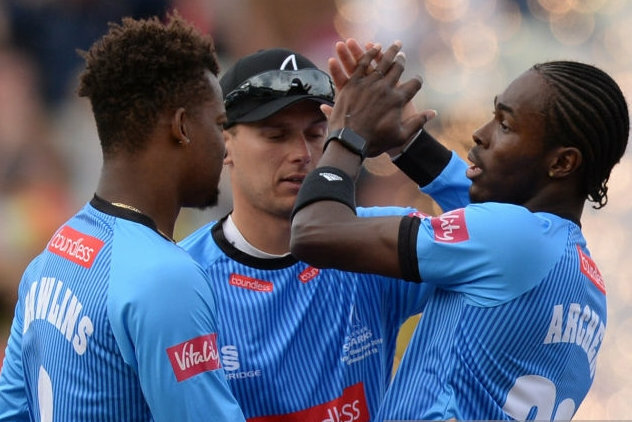 Delray Rawlins and Sussex went down by 5 wickets in the Vitality Blast Final to Worcestershire. Batting first Sussex scored 157/6, Laurie Evans was the top scorer with 52, Rawlins scored 21 off 16 balls hitting 2 fours. In reply Worcestershire would score 158/5 off 18.3 overs, Oliver Cox was the top scorer with 46 not out. Delray Rawlins and his Sussex teammates won their Vitality Blast Semi-Final by 35 runs over Somerset. Sussex would score 202/8, Laurie Evans was the top scorer with 92 off 53 ball, while Rawlins scored 18 off 12 balls, hitting 2 fours and a six. In reply Somerset would only score 167/8, both Thomas Abell and Corey Anderson both scored 48, Jofra Archer was the pick of the Sussex bowlers with figures of 4-0-32-3, Rawlins held onto a catch.